Vortex diffusor adapter for a 18.8mm ground joint bong and a 14.5mm ground joint bowl. The vortex diffusor swirls the steam into small bubbles better than most other diffusors, thus improving the taste. 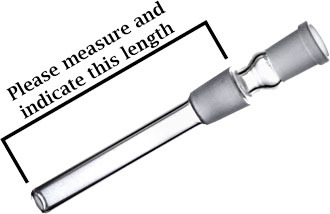 Please measure the stem without the bowl. How can I measure the right length of the downpipe?